To perform the flutter kick, use small, fast and rhythmic kicks. Swimming with a flutter kick requires that you use your abdominals, glutes and paraspinal muscles to stabilize your body. If you jump into the water three times a week and do laps for 15 to 30 minutes of freestyle or backstroke, you’re on the way to flattening your tummy. If you can’t get to the pool, you can always do flutter kicks on land. In Navy SEAL training, one of the most stressful drills is flutter kicks. Recruits have to do 350 four-count flutter kicks to build up their six-packs. Staying afloat and maintaining your balance on top of water will strengthen your abdominal muscles. For example, push off from the wall and move across the pool on your back. Press your arms to your sides, point your nose up and keep your head aligned with your spine. Use the flutter kick to propel yourself. Push down on the pressure point, which is located between your shoulder blades. Contract your stomach muscles to keep your lower back straight. Used to train competitive swimmers, the vertical kick is an intense exercise that will blast your abdominals. Perform this exercise in the deep part of the pool where you can maintain a vertical stance without touching the floor. Place one hand over the other and use the flutter kick to keep your head above water just below the chin. Point your nose straight forward and keep your hips positioned directly under your shoulders. If you need more support, use a small float to give your upper body more buoyancy or begin with full-size fins. Graduate to short fins as you master the drill and then take the fins off. Boost the intensity of the exercise by putting your hands on your head or fully extending your arms overhead, which will require a speedier kick. Perform an interval in which you kick for 15 seconds and then rest for 15 seconds. Use your abdominal muscles to maintain a position while moving underwater with a kick board. Hold a kickboard pressed to your back. Your head, neck and shoulders should be above water. Form an L-shape with your body, bending at the hips with both legs fully extended in front of you. The position should resemble a sitting position. 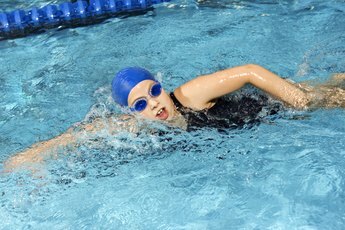 While in this position, use the flutter kick to move backward through the water. Contract your stomach to keep your body upright and balanced. You can wear short-fins to give your legs a more intense workout. Because the surface area of a fin is greater than your foot, it adds resistance to your movement in water and is akin to adding weight. By kicking with fins, you can intensify a workout for not only your legs but also your abdominals. Similar to weights, begin with light resistance or short fins. Progressively increase resistance by using longer and larger fins as you grow stronger. Using the front crawl or backstroke, perform the flutter kick at a high intensity for short spurts. 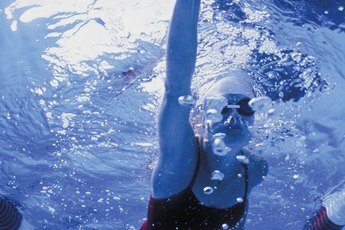 Think of the exercise as interval training in water, taking rests between stretches of kicking. Clinical Mastery in the Treatment of Myofascial Pain; Lucy Whyte Ferguson, et al. Complete Conditioning for Swimming; Dave Salo, et al.